Three bedrooms have a private bath while the forth has a shared bath with the great room. The living room, dinning room, and kitchen form the great room which opens onto the deck through french doors. My wife and I have been enjoying Lake Tahoe and all the summer and winter amenities since the 1950's. The weather is perfect with sunny days yet mild temperatures. Best of all the nights are cool and clear with dark star-filled skies. The home is new with modern features. It is centrally located next to the beach and close to all the summer and winter activities. I just added a Tesla Charging Station in the garage. Well stocked with spices, sugar, and flour. There are stairs between the ground floor and the floor above. Very beautiful cabin, location is very convenient to grocery store and for us Northstar. We plan to come back in the summer since the cabin is directly across from the lake! The house is pictured accurately and was really spacious and comfortable. The view of the lake and the sunsets are gorgeous from the upstairs living room! The kitchen was well stocked with basic cooking equipment and utensils in case you want to cook while there. 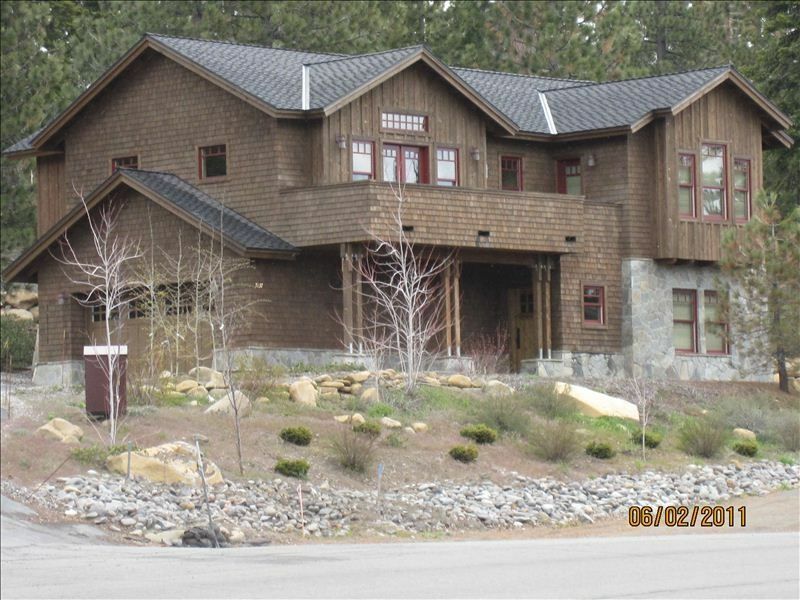 The house is located close to Northstar, Truckee, and not too far from Tahoe City. If we were there in the summer we would have walked to some of the restaurants and stores close by, but it was too cold during our trip! John was a great host and provided clear instructions on using the different areas of the house and was reachable if there was an issue. I would definitely recommend staying here. Very convenient location. The house is clean, new and well maintained. We had a great week and learned alot from the tours we took around the lake. Good location with great views but lots of road noise. We had family over from the UK for a wedding and spent five days at the house. It is in a great location close to the lake and with great views but right on the main road so extremely noisy, and with it being hot and having no air conditioning the windows needed to be open. The house layout is good inside but has limited outside area. The deck is very narrow and could not seat six for casual conversation or dinner which was disappointing considering the views. There is no other outside seating on the property. The “great room” layout is nice with traditional cabin furnishings and is a perfect size for six. The kichen was a good layout but needs some investment in items such as kitchen knives, scissors and BBQ utensils (which we bought and left). The bedrooms and bathrooms are nice but again the sheets and towels are in need of replacing as they are well used. The master bed sheets were threadbare and one of the pillows had been the victim of what looked like someone’s nose bleed. Everything felt a bit worn so a little investment in upgrading the linens, kitchen items, outdoor BBQ and furniture would go a long way. This property could easily get a higher rating with a little TLC. My guests from the UK were very nice. They arrived five hours after the previous guest. The previous guested rented my home for 6 adults and 4 children, but arrived with 8 adults, 10 children, and 3 babies. My home was overused and abused, but the cleaning company did their best. I had to scrub the deck and clean the BBQ the following day. The kitchen now has scissors, and I purchased new sheets for all the beds. The deck is 30 feet long and 8 feet wide with seating for 8 so I am not sure how to improve it. Only one in a hundred homes has air conditioning because the nights get down to 30 to 40'F. The problem at 6300 feet elevation is staying warm. I so sorry that my guest hit a warm week at Lake Tahoe. I appreciate the constructive criticism, and I work hard to address all problems so my guests have an enjoyable stay. If you would like to be harassed and stalked daily, stay here. We had a large group—15 adults and 14 children—staying at 3 separate houses. When we booked John’s house, 3 couples and 5 children were planning on staying. Later on, another couple joined. We were thrilled! Since John's house had 4 bedrooms, we figured that each couple could take a room. We did not update John on this change, which was an oversight and mistake by us. On the 2nd day, John demanded to know how many people were staying at the house. I explained what happened and that we had 8 adults and 6 children. I apologized, took immediate responsibility, and asked how I could rectify the situation. I offered to do a walk-through before we left so that we could clean/fix anything he found amiss. We also rearranged 3 of our 5 combined dinners to other locations. Then came the daily badgering. "You sure have a lot of garbage," said Patricia, John’s wife, to a friend. Our friend apologized, and she continued to criticize: "We try and recycle here." Our friend agreed that he also tried to recycle. Patricia retorted, "I see a can in your trash bag." Our friend is very even-keeled and kind, and he came back rattled because she was so cantankerous and rude. Another quote: "When people rent the house, they don't know that we're right next door watching them, but we are. We're watching you!" Caution, you will be watched and judged for your every recycle-miss in your trash. On our last day, despite no cleaning responsibility, we cleaned everything John had expressed concern about. During the walk-through, John approved and said we’d receive our full deposit. Imagine our surprise at the email saying he was keeping $300! He cited a broken baby gate (that we had replaced), dirty BBQ (we never used), excessive utilities (he got a utility bill within 24 hrs? ), spills on the deck (guess I should have spent 2 min to sweep and mop, but I thought I paid for cleaning service), and carpet stains (they were indeed very stained when we got there; John needs new carpet). We made a mistake with our numbers. But we tried at every turn to rectify that mistake and be open and kind. In return, we were met with rudeness, harassment, and flat-out dishonesty with our deposit. We would've had a more relaxing vacation staying at another location, camp site, or maybe even a bear's den. Do yourself a favor: find a different house to rent, and actually enjoy your time in beautiful Lake Tahoe. 4 night minimum stay for Thanksgiving, Christmas and New Year's My home sleeps 8 adults or 8 adults and 2 children on trundle beds max.